In an ideal world the ranking of an institution as the most corrupt in a country is enough reason for the head of that institution to resign or initiate radical reforms to mitigate the situation. 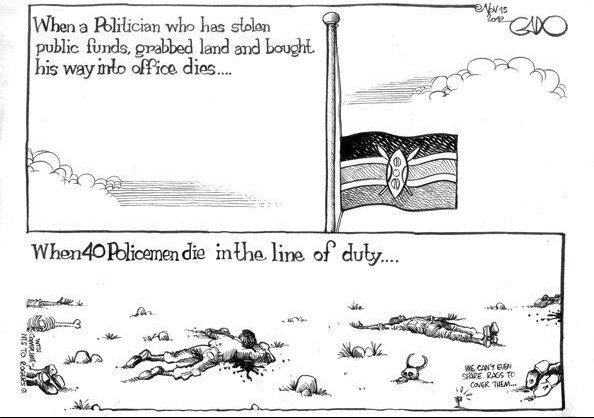 But this has never been true for the Kenya Police Force. Every year, the Kenya Police Force has emerged as the most corrupt institution in the country without serious repercussions at Vigilance House. It therefore came as welcome news when the president announced today the replacement of Major General Ali with Mathew Iteere as Police Commissioner. Ali tried to rein in organized crime and to tame the proscribed Mungiki sect. The executive lacked the political will to let him finish the job and Ali lacked the spine to take the fight to those who stood in his way. He was also anti-reform, which must be the main reason why the president has chosen to show him the door. His legacy will forever be tarnished by the force’s extra-judicial killings that took place on his watch. But he will also be remembered as the no-nonsense commissioner who moved the force from the backward days of the Nyayo era police state towards a force befitting a quasi-democracy. Many would agree that for a reformer he lasted for too long at the helm and therefore failed (kind of like what will become the fate of his former boss, President Kibaki). Mr. Iteere, from the paramilitary GSU, comes in at a time when the force needs urgent structural and operational reforms (as recommended by the Ransley report). I know nothing about the man but I hope he is strong enough to stand up to the president’s men (and increasingly the Premier’s men too) who might stand in his way. We wish him well.